Beyer Studio was founded by Joseph and Rita Beyer in 1980. The studio offers a full range of services in stained glass, including design and fabrication of new windows, restoration of existing windows, consultation about protection glazing and framing and more than ten years of experience in the adaptive reuse of historic stained glass windows for new churches. 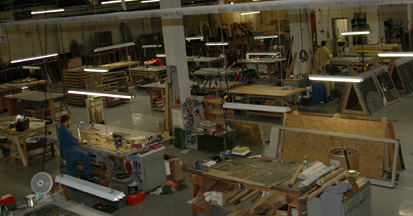 Since its inception, the studio has been located in Northwest Philadelphia, first in West Mt. Airy and for the past twenty-one years in historic Germantown. 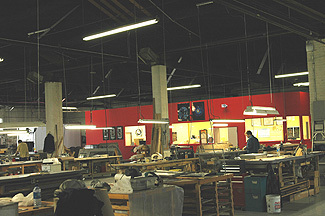 In January 2005, Beyer Studio, Inc. officially moved into its new location in Germantown (still on Wayne Avenue, just three blocks north for former visitors at 4813 Wayne Avenue). The new facility, which at 13,200 square feet is nearly three times the size of our former workspace, has allowed for every artisan to have a workbench of his/her own and still have room for expansion. The building also provides us with better space to define and organize work, such as areas for painting, patterning and selecting, glass inventory, window storage, office, lunchroom and a projection room. We are very happy in these new digs and will probably have an official opening in Fall 2005. Over the past twenty-five years, the studio has amassed a portfolio of impressive clients and commissions, including the Archdiocese of Philadelphia, several major universities and colleges and a nationally based list of churches. Recent projects for the design and fabrication of new windows include St. Cyril of Jerusalem Church in Jamison, Pennsylvania, Our Lady of Mercy Church in Potomac, Maryland, St. Joseph's Church in Beltsville, Maryland, St. Basil the Great Church in Kimberton, Pennsylvania, St. James Episcopal Church in Wilmington, Mariner Bethel Church in Bethany Beach, Delaware, Grace Episcopal Church in Wilmington, Delaware, Annunciation Church in Columbus, Mississippi, Trinity Episcopal Church in Wilmington, Delaware, St. Joseph's Church in Aston, Pennsylvania, St. Gabriel of the Sorrowful Mother Church in Avondale, Pennsylvania, St. Stanislaus Church in Lansdale, Pennsylvania. Over the past five years, Beyer Studio has been commissioned for numerous church and special restoration projects: several thousand windows on the campus sites of Princeton University, including the Humanities Center, Lockhart Hall, Jones Hall and Holder Tower, and Bryn Mawr College, including Goodhart Hall and Rhoads Hall; the Tiffany window in the façade of Alexander Hall at Princeton University and a Tiffany window for the Kearsley Retirement Community; the Violet Oakley window depicting the "Wise and Foolish Virgins" in St. Peter's Episcopal Church in Philadelphia; and, restoration of the stained glass in the stairwell and Lincoln Rooms at the Union League of Philadelphia. The studio currently has on-going restoration projects at St. Mark's Episcopal Church in Philadelphia, St. Paul's Catholic Church in Portsmouth, Virginia, the First Presbyterian Church in Bloomsburg, Pennsylvania and Trinity Episcopal Church in Wilmington, Delaware. Other past historic restoration projects include the restoration of the chapel windows at the University of Virginia. Beyer Studio has been involved in the adaptive reuse of hundreds of historic windows. Our expertise in this newly evolving segment of the field of stained glass insures a seamless transition from the original format of the windows to the new site format. Beyer studio employs seventeen stained glass artisans, all of whom either hold degrees in a fine arts discipline or have extensive experience in the building trades. This specialized art focus and the resulting understanding and commitment of our personnel provides the studio with great depth in the process of creating and restoring windows. We are proud to present our staff to the right and below. Established Beyer Studio specializing in design and fabrication of architectural stained glass as well as the restoration of historic stained glass windows. Joseph is responsible for the distinct contemporary style of the studio's new windows, many of which focus on the use of the figure and the visual reinvention of religious themes. He is an adroit stained glass painter as well, specializing in figurative rendering. 1972-1976 PHILADELPHIA COLLEGE OF ART (now Univ. of the Arts) Philadelphia, PA . BFA Painting. 1978-1980 WILLET STAINED GLASS STUDIO Apprenticeship in stained glass design and painting. BFA in Illustration, UNIVERSITY OF THE ARTS, 1988. Bryan has has been with Beyer Studio the longest, since 1991. He is one of the studio's glass painters and premier craftsmen. He is also an independent artist in glass and oils and shows annually at galleries in olde City, Philadelphia. BFA Illustration, PHILADELPHIA COLLEGES OF THE ARTS (now Univ. of the Arts), 1987. Eric has worked for us since 1992 and is now one of the studio's premier designers and painters. His work is featured in the Drake Tower in center city Philadelphia. He is particularly adept at restoration painting. He has been a member of the Pennsylvania Army National Guard 104th Cavalry for 20 years. Mike joined the studio in 1998, bringing with him extensive experience in civil construction, specializing in HVAC. He serves as site manager on projects but has eagerly learned the stained glass process as well. Simon has worked for Beyer Studio since 1999 and brings the British invasion to us, Simon is also among the studio's premier craftsmen. Neil is a musician and has worked professionally as a sound technician for concerts in the Philadelphia region. He came to work for us In 1998. Justin joined Beyer Studio in March 2000 and has been an enthusiastic addition to our work force as well as a reliable and resourceful craftsman. Jason joined our team the spring of 2003 with a history of working in theatre set design and working with stained glass and Mosaic work. Rachel joined our team the summer of 2004 after working with Mural Arts of Philadelphia. Before coming to us Josh has worked in antique restoration and custom framing. Josh is also an active Musician playing Guitar and Mandolin in the Philadelphia area and has recorded 3 albums. He worked as a finish carpenter for two years before joining the Beyer Studio team in 2007. Fred graduated in 2013 with a BFA in in Illustration from The Univercity of Arts. Fred worked in graphics creating T-shirts brefore joining Beyer Studio. Fred also works as a musician, recording and touring. Graduated 2011 BFA Art History, minor Studio Art from Eastern Michigan University. Audrey brought her eclectic artistic skills and experience to Beyer Studio in 2016. Graduated 2000 with a BFA in from Cleveland Institute of Art. He worked with us from 1997 - 1999 during the summer. Worked for Willet Studios 2006 - 2014. When Willet Studios closed Alec came back to work for us. Graduated from Tyler School of Art studying Jewelry - metals - CAD and has joined Beyer Studio full time in 2017. Ben came to us after working as a machinist. Bart joined us after working 20 years in general construction renovating homes. Graduated with a BFA in art History from Tyler School of Art. Beyer Studio in 2017 after intering in the conservation labs of Phila. Museum of Art and The Barnes. Molly interned at Beyer Studio while attending Moore College of Art and Design. After graduating she joined Beyer Studio full time in 2017.